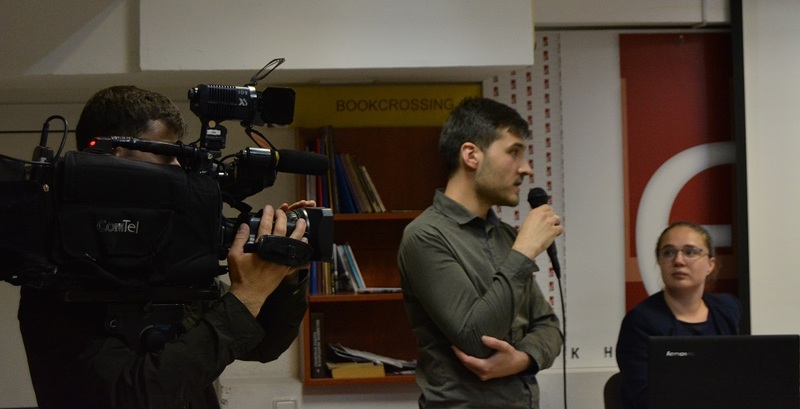 UISGDA held a discussion at bookstore Ye, participants of which were director of Kiev department of the Institute, Doctor of Philosophy, Professor O.Bilokobylskyi, academic secretary of the Institute, candidate of philosophical Sciences, Ruslan Khalikov and analytics of UISGDA V. Gurzhy and K.Gurzhy. The event was dedicated to the problem of use of religious values’ mobilization potential in modern times, in particular in the process of expansion of the conflict in Donbass. Particularly it was about our world entering a new age of globalization – post-secular. Its main symptom is an appearance of alternative projects, which are alternative to the Western. Chinese, Islamic and Russian projects are formed around religious and traditionalist values and appeal to the people’s religious feelings. That’s why they can challenge Europe and the USA, who have more resources. This thing played an important role in Donetsk, where the mobilization potential of the Russian world was used in the spring of 2014 - religious events, symbols, names, calls, etc., which raised residents of Donbass to "the fight against soulless West." Events of 2014 in Donetsk is one of many examples, when religious imperatives and values were used in a global fight of a post-secular world.